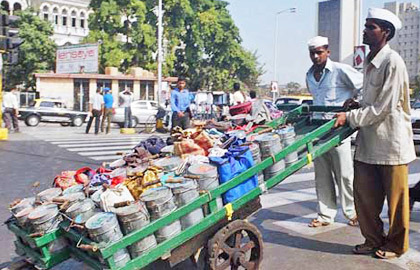 The Dabbawalas of Mumbai are world renowned and a topic for a fantastic case study. B-School students are exposed to the virtues of their quality systems and management with emphasis on six sigma as a learning paradigm. There is a connection between time management and the Dabbawalas’ saga as well, which is not emphasized in any management text. A Dabbawala, (Hindi: Dabba – (Lunch) Box, wala – One who carries) is a person in Mumbai, India, whose job is carrying and delivering freshly made food from home in lunch boxes to office workers. Though the work sounds simple, it is actually a highly specialized trade that is over a century old and which has become integral to Mumbai’s culture. All Dabbawalas belong to the Warkari sect. They still wear the same attire with a Gandhi Topi. At 19,373 persons per square kilometer, Mumbai is India’s most densely populated city with a huge flow of traffic. Because of this, lengthy commutes to workplaces are common, with many workers traveling by train. A collecting Dabbawala, usually on bicycle, collects dabbas from homes or, more often, from the dabba makers (who actually cook the food). The dabbas have some sort of distinguishing mark on them, such as a color or symbol as most Dabbawala are illiterate. The Dabbawala then takes them to a designated sorting place, where he and other collecting Dabbawalas sort (and sometimes bundle) the lunch boxes into groups. The grouped boxes are put in the coaches of trains, with markings to identify the destination of the box (usually there is a designated car for the boxes). The markings include the rail station to unload the boxes and the building address where the box has to be delivered. At each station, boxes are handed over to a local Dabbawala, who delivers them. The empty boxes, after lunch, are again collected and sent back to the respective houses. Everyone who works within this system is treated as an equal. Regardless of a Dabbawala’s function, everyone gets paid about 2-4,000 rupees per month. More than 175,000-200,000 lunches get moved every day by an estimated 4,500-5,000 Dabbawalas, all with an extremely small nominal fee and with utmost punctuality. According to a survey, there is only one mistake in every 6,000,000 deliveries. The American business magazine Forbes has given a Six Sigma performance rating for the precision of the Mumbai Dabbawalas. The BBC has produced a documentary on Dabbawalas, and Prince Charles, during his tour to India, visited them and he had to fit in with their schedule. Some of the Dabbawalas have been invited to give guest lectures in top business schools of India. Most remarkably, the success of the Dabbawalas’ trade involves no modern technology. The main reason for their popularity is the Indian people’s love of home-made food delivered punctually. This service is uninterrupted even on the days of extreme weather, such as Mumbai’s monsoons. The local Dabbawalas at both ends are known to the customers personally, so that there is no question of lack of trust. Also, they are well accustomed to the local areas they cater to, which allows them to access any destination with ease. Occasionally, people communicate between home and work by putting messages on chits inside the boxes (chits survive even in this era of mobile phones!). 99.99% success rate ON TIME. EVERY TIME! Each and every office goers get their Tiffin and lunch meal on time satiating their appetite with homemade food. The Dabbawalas are generally uneducated and illiterate, many don’t wear a watch either but they perform to six sigma levels day in and day out, on time, relentlessly. Imagine if one of the Dabawalas thought “I am too tired to get up at 5.15 and I will get up at 6.15 am.” Which means 15 customers would go without their daily meal. It is more of a realization that the customer is the Annadataa giving them their lunch and not any other compulsion for work efficiency. Maybe all our brand toting management graduates should be made to do a field internship with the hard working, faultless and efficient Dabbawalas for sometime; forsake an international internship jaunt to exotic locales like Poland or Japan to learn the basics of Time Management on our very own Indian soil. Ask the Mumbai Dabbawala the secret of his efficiency and time management. Way cool, some valid arguments! I appreciate you making this article available, the rest of the site is also well done. Have a wonderful. Hmm, your approach of explaining the event with perfect instances makes the post a valuable one, nice work.